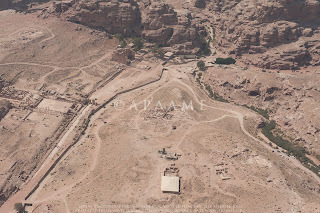 One of the purposes of our aerial reconnaissance in Jordan is to cover places we haven’t flown before as well as to monitor sites we may have photographed a few years ago. We also respond to requests for targets to be photographed. With all this in mind we organised a two-day trip to stay overnight in Aqaba on the Red Sea, flying from the air base in Marka (Amman). An example of one of the impressive landscapes we were treated to. 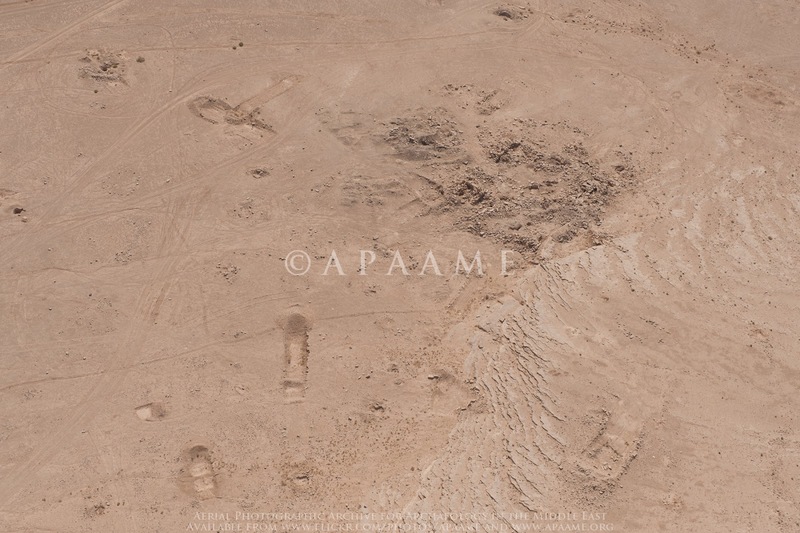 APAAME_20151005_REB-0152. 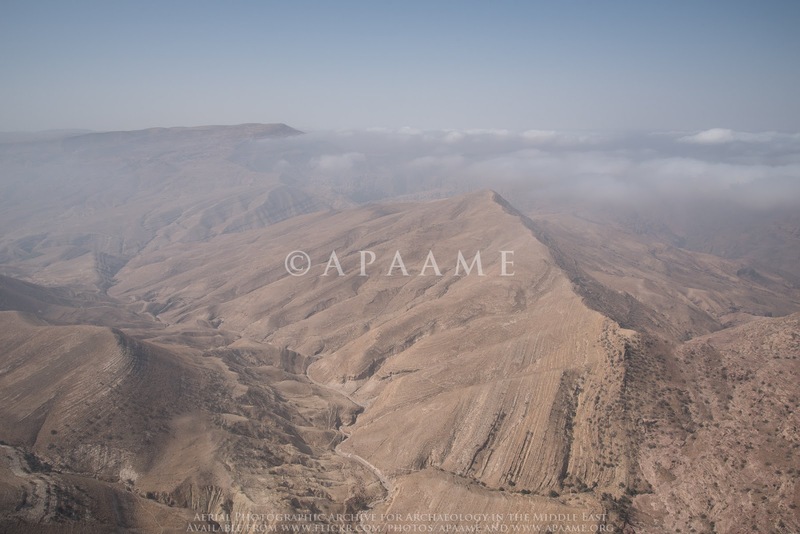 We flew down to the Tafilah-Kerak area, recording many stone-built sites and villages, and of course the odd Roman road, and crossing the very impressive Wadi al-Hasa and Wadi ad-Dana. However the light was not great, until about 8 o’clock, as the weather was on the change. The landscape did its best to distract us from the archaeology- except where the two went hand in hand such as the Iron Age site of Shag Rish dramatically perched above the Dana Nature Reserve to the south. The Iron Age site of Shag Rish. 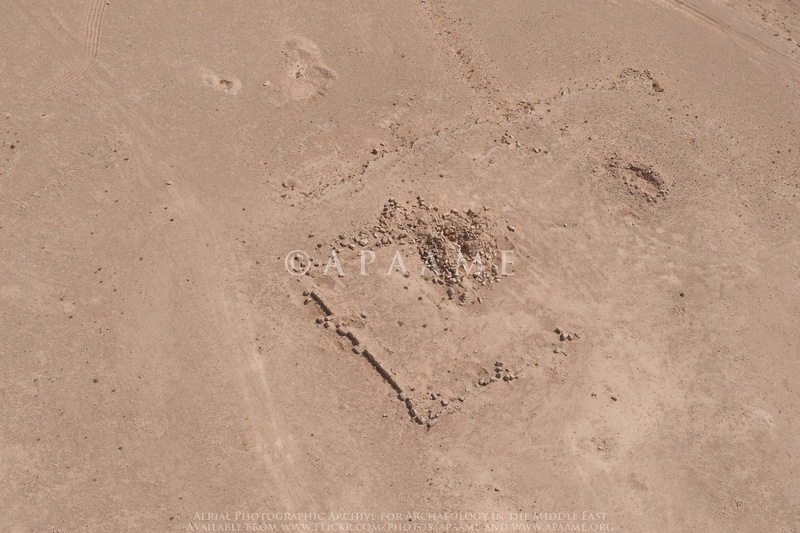 APAAME_20151005_REB-0134. 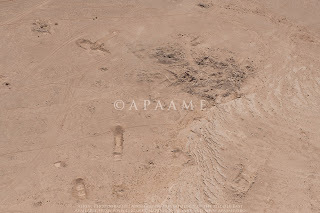 We had to refuel at the desert oasis of Al-Jafr and en route spotted an archaeological excavation (in the middle of nowhere), which we presume to be part of the Japanese expedition exploring neolithic sites (Directed by Dr. Sumio Fuji). Arrival at Al-Jafr was a first for our co-pilot, who, despite having been in the RJAF for 6 years had never tasted the delights of Al-Jafr. Courtesy of a small convenience store the pilots indulged us with some Chocolate Milk before we headed south-east to record sites on the high plateau before dropping down into the Wadi Araba. Excavations north-west of Al-Jafr. APAAME_20151005_DLK-0085. 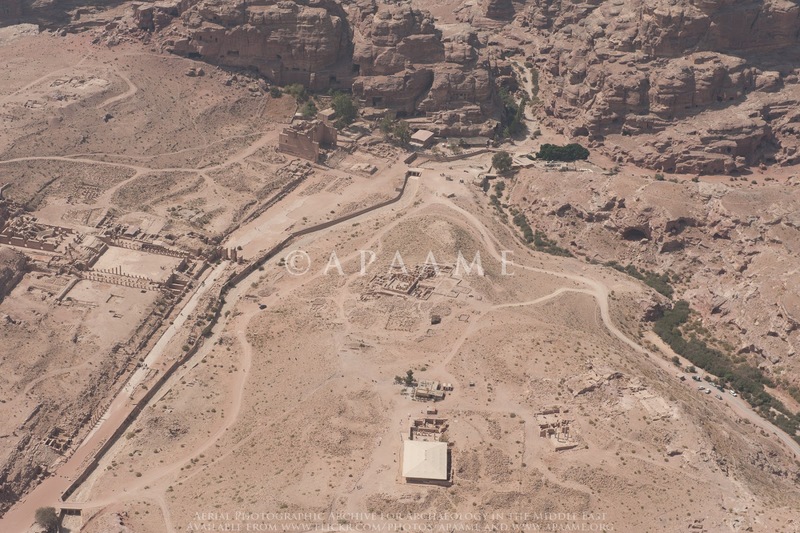 We had the unexpected bonus of a reasonably high-level flight over Petra (gone are the days when we could descend in the helicopter to take close-ups of the tombs, but look at the photos from 1998 (Flickr album Flight 19980520)). Jordan was having a warm spell and Aqaba was 37 degrees, and as we were informed as we arrived at the hotel, the sea temperature was 26 degrees. Water has to be that warm to entice me in and very refreshing it was. Drying off on the beach I was joined by our crew-man, who spoke good English and asked why we always photograph the same sites (as he has been on many trips with us). I explained that we didn’t but that we fly very similar areas as there are so many sites, often very close together. He then asked if the sea was "perfidious". I struggled for an answer, but said that if he meant treacherous then yes, but we wouldn’t necessarily use “perfidious” for the sea. 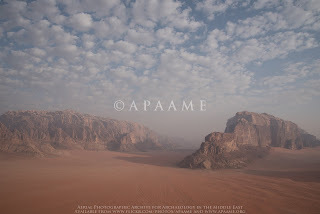 The landscape of Wadi Rum. APAAME_20151006_REB-0013. The next day was one of the rare days when not only is the archaeology stunning, so was the scenery and the flying. We literally climbed the hills out of Aqaba to the east (and slightly north), and emerged (having dodged a few clouds) into the Wadi Rum. It doesn’t matter which way we looked, into the hazy sun, or with the sun behind us, the scenery was quite enthralling. 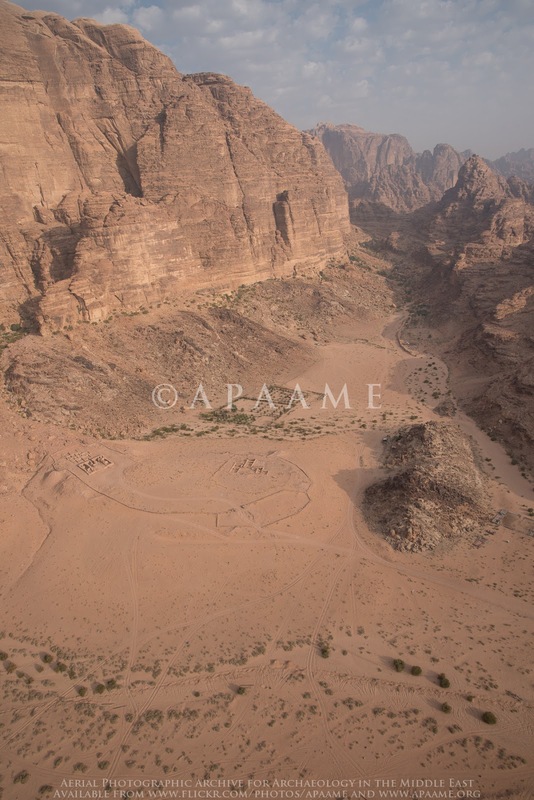 The archaeological site of Wadi Rum. 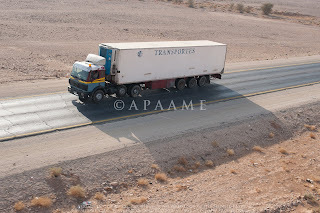 APAAME_20151006_REB-0026. We then aimed for the Hejaz railway to continue where we had left off the previous year, helping the Great Arab Revolt Project (GARP) with its surveys; many Ottoman installations and tent circles are clearly visible. 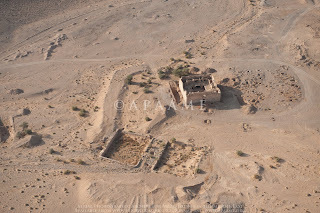 The isolated Hajj Fort of Qal'at Fassu'ah was also a highlight. 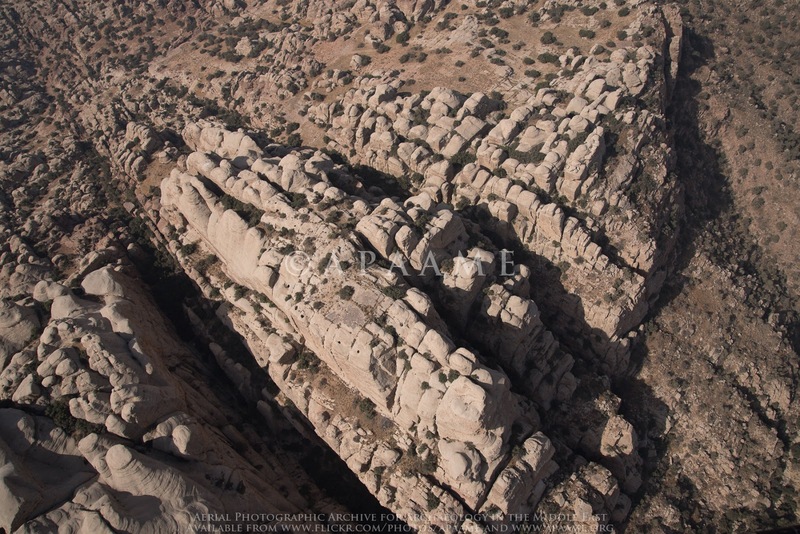 An extended break between sites along the Hijaz saw our pilots give us an example of their idea of flying. The pilots decided that the helicopter was a train and they flew at low-level above the tracks making “chuff-chuff” noises. Bored with this, and seeing that the main road to Saudi Arabia adjacent to the railway they decided to pretend to be a lorry, on the wrong side of the road; all the while reassuring us that the oncoming lorry drivers were laughing and waving, thinking how much fun this was for them. We do now have some very “low-level obliques” of vehicles not many feet away. A lorry driver waving as we flew by. 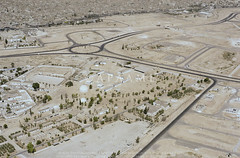 APAAME_20151006_RHB-0137. We were glad of a pit-stop at Al-Jafr to regain some composure after such 'interesting' flying, and refuel for the helicopter and ourselves, consisting of dates and digestive biscuits sitting in the shade of the Huey. 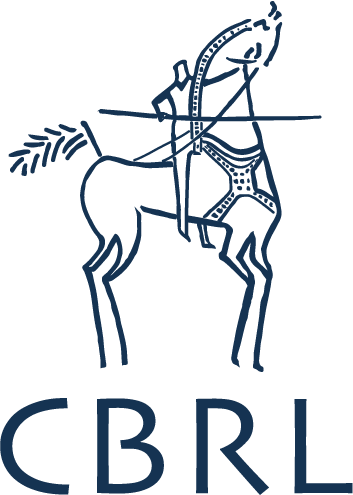 Qasr Mesheish. The damage, probably done for the building stone, is clearly evident. 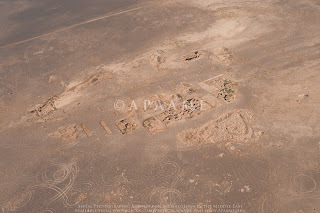 APAAME_20151006_DLK-0347. The final leg heading north back to Amman took us to a site Sir Aurel Stein had photographed in the 1930s, Qasr Mesheish – the site was visited by both Musil and Glueck, but has not been researched since to our knowledge. Their opinion was it may have Nabatean origins, perhaps a caravanserai. There are clearly other features nearby, a structure or enclosure with tower, as well as cisterns, and a later(?) cemetery. Unfortunately, the site is clearly suffering extreme damage. 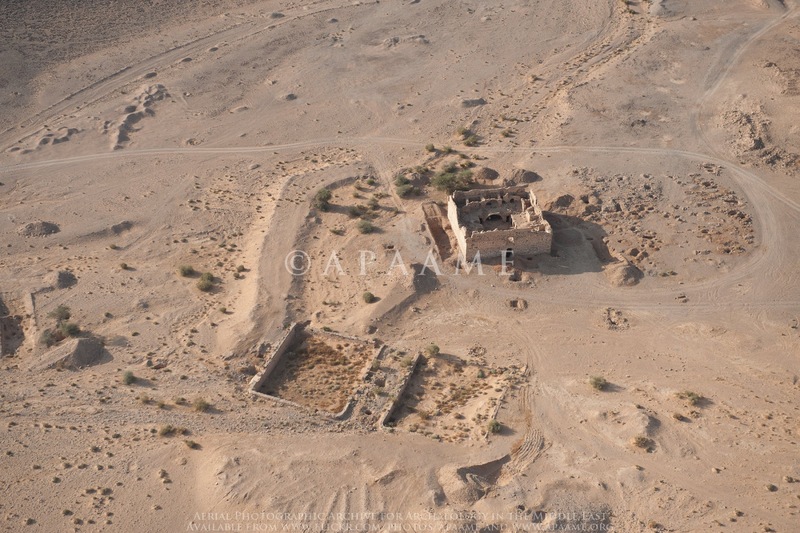 Our final target for the day was over the caravanserai of Khan es-Zabib. The secondary structure at Qasr Mesheish - a tower within a larger enclosure. 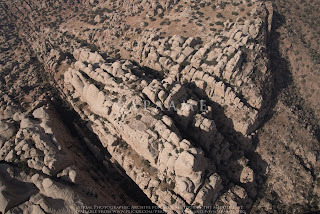 APAAME_20151006_DLK-0350. Tired but invigorated after a very special and privileged two-day reconnaissance over southern Jordan, we drank tea (or coffee) with the flight commander to plan the next day’s flight, over the Greater Amman area. Thanks for including the images I requested. Just starting to look through them all with great interest. Thanks for the post about thi Auto Repair West Palm Beach FL topic. Im a big fan of the blog, i've even put a little bookmark right on the tool bar of my Firefox you'll be happy to find out!